Arrange the bus passengers to match the number in the sign. They may come in pairs or in groups of three, too. Once your kids are able to identify numbers up to 100, the next thing they can do is to learn how to count. You could argue that teaching kids how to count is a trivial thing. Sometimes it’s so trivial that the activities can be a bit boring for younger kids. Fortunately, Shiny Things offers five fresh approaches to learn counting in their brand new app, Quick Math Jr. My kids love to play with the new mini games. And when kids love playing an app, they will definitely learn something new from it. Each time you hit the play button, Quick Math Jr. will pick three mini games at random. Then, it will do another round of random pick to select which game to play first. One of the games that you can play is the Bus game. A double-decker bus or a quadruple-decker bus enters the screen with a number of passengers. You need to match these passengers by dragging them on and off the bus. Sometimes they come in pairs or in groups of three, which can create a challenge as you arrange them inside the bus. The bus passengers are actually cute monsters that you can create and customize. Each time you complete a set of three games, you can spin the wheel of rewards to win a new set of eyes, noses, mouths, hats, or even a new monster. You can drag the monster into the monster factory in the main menu to customize it. The other game that you can play with these monsters is called Count the Monsters. They show up in numbers that are organized in a particular pattern to make it easy for you to count. Then, you can count them and identify which among the four numbers or dot patterns matches the number of monsters. The more you play, the more difficult it gets. Later on, you’ll need to perform simple addition/subtraction, or identify a number name (e.g., sixteen). Quick Math Jr. reuses the excellent handwriting input from its predecessors. Instead of choosing from the four options, the game may require you to write your answer on the blank sheet. The app also includes three additional mini games that offers a fun twist to classic counting games. For example, in the Light Bulb game, you’re asked to count the monsters quickly before the light is turned off. In the House game, you’re asked to count and remember how many monsters are inside the house as they go in and out. Again, sometimes they may come in pair or in groups of three. In both of these games, you may be required to choose the correct option or write the result on screen. 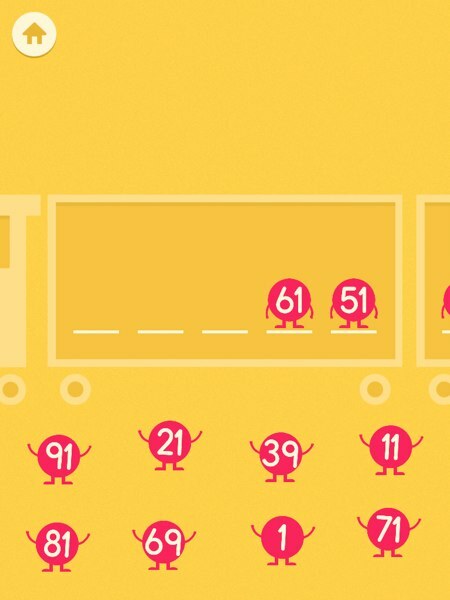 Finally, you can also learn about number sequences in the Train game. The game asks you to identify the missing numbers in an arithmetic sequence. The sequence may be a simple increment or decrement. But, it may also require you to skip counting by two, three, five, or even ten both forward and backward. Quick Math Jr. is designed to be aligned with Common Core math curriculum for Kindergarten and Grade 1. The early parts of the games are suitable for kids ages 3+, but as you progress through the game, the difficulty level increases and provides kids ages 6+ with enough challenge. The app supports unlimited number of user profiles, making it perfect for both family and classroom use. Because the games use the monsters that you have created, you might want to customize your monsters whenever possible. The monster factory allows you to change your monster’s appearance whenever you unlock a new body part. In addition to the reward wheel, you can also unlock new items by completing the challenges in a timely manner. Kids can learn about number sequences by filling in the blanks. The mini games in Quick Math Jr. are fun to play and quite innovative. They offer a breath of fresh air when it comes to counting game designs. Both the Light Bulb and House games are simple twists to classic game mechanics that lead to a more fun and challenging gameplay. The developers also reuse many of the game elements. For example, they can switch the challenge parts from monsters and numbers to addition/subtraction and number names. They can also switch the answer input methods. This interchange plays an important role to keep the games fresh and challenging every time you play. Kids can also learn about simple addition and subtraction alongside pattern matching. Quick Math Jr. offers a fresh approach to learning about counting and basic addition/subtraction. It shows that adding simple twists and new game elements to classic game mechanics can make the activities more fun and challenging. I wish more developers can follow the examples shown by Shiny Things and develop their own unique ways to improve the way our kids learn math. I created an analog version of the Bus mini game, using two dices and some LEGO bricks. To be exact, I used ten 1x1 bricks, five 1x2 bricks, and three 1x3 bricks. It'd be best to use different colors for each brick type. Ask your kids to roll both dices and put the correct number of bricks onto the hand-written bus seats. Enjoy!